As we continue to celebrate Black History Month, I thought I’d repost a letter that tells the story of a very special person in my history. She’s one of the greatest people I’ve ever known and to whom I owe a great deal. Enjoy. I once heard someone say that if you want to develop patience, spend lots of time at the Department of Motor Vehicles. I would also include airports in this statement. For me, traveling provides opportunities for developing various character traits. An airport—any airport—is like a life-size petri dish where I’m forced to grow qualities like patience, delayed gratification, anger management, and/or the restraint of homicidal impulses. And I’ve been forced to develop empathy. I rarely get upset with airport personnel because I think, by and large, they’re doing the best they can with what they’ve got. I watched an impatient traveler not long ago chew out a ticket agent over a weather delay. He gave that agent a piece of his mind he could not afford to lose—and did it loudly. This is where my enhanced homicide-restraint ability came in handy. The guy was being a world-class jerk. I could put myself in the agent’s place and imagine what he must be feeling. That’s called empathy. And if he’s not bothered by his negatives, why would he bother to change them? When a person lacks empathy, we use derogatory—but accurately descriptive—phrases like, “It’s all about him,” or “The world revolves around her.” Empathy-deficiency is what causes a guy to chew out a ticket agent for a weather delay. It’s all about him. The Golden Rule is a description of empathy: “So whatever you wish that others would do to you, do also to them.” Or to put it another way: Treat people like you want to be treated. I’d like to tell you an empathy tale, a true story of someone who personified this quality better than anyone I’ve ever known. And that’s high praise because I’ve known some Olympic-level empaths. Bare with me as I’ll tell you the backstory before telling you the empathy story. I was born and raised in Jackson, Mississippi, during the era of those nasty Jim Crow laws. Jackson was a magical place to grow up—if you were white. But if you were black, not so much. It was a racially segregated culture in which blacks and whites lived on opposite sides of town. Like a tattoo containing the name of a girl you no longer date, there are certain mental images you wish would go away but never will. I distinctly remember my mother taking me downtown to a department store to buy clothes. There was a column in the store with a drinking fountain on one side with a sign above it that said, “Whites.” That fountain was all shiny and clean. On the other side of the column was a fountain with a sign above it that said, “Coloreds.” That fountain was filthy and grungy. Sometimes, I wish there was a button I could push to delete that image from my brain. Here’s another image I’ll never forget. Directly across the street from our house was a bus stop. Whites would enter the bus from the front, but the black ladies who worked as maids in the neighborhood would always enter from the rear, as would yard workers who were also black. For whites born in Jackson during this era, reminiscing about childhood would likely conjure up warm feelings and pleasant memories. Reminiscing blacks might have pleasant recollections as well but theirs would be laced with discrimination memories—back doors, filthy fountains, restricted access, racial epithets, and yes, even physical violence. Jackson back then was, in many respects, a collective drama. The unspoken—or sometimes loudly spoken—arrangement was: Our role (whites) is to be in charge and your role (blacks) is to do what we need you to do and be whom we need you to be. As long as our two races stay inside of those role obligations, we’ll “get along.” Being black in a white culture meant “knowing your place and staying in it.” That was the drama obligation. But there was something about all this that’s very hard to put into words. Despite the inequities, the injustices, and the wrongness of it all, there existed a warmth of connection between some blacks and some whites. Prejudice sat alongside affection and neither was forced out by the other. “The test of first-rate intelligence,” said F. Scott Fitzgerald, “is the ability to hold two opposing ideas in mind at the same time and still retain the ability to function.” Prejudice and affection don’t normally occupy the same space and yet they did somehow. I’ve seen two movies that illustrate so very well this hard-to-fathom incongruence. The first was Driving Miss Daisy. Miss Daisy was a rich white woman being driven by a poor, yet enterprising, black man. She was up and he was down. And yet, a bond of affection developed between the two that prompted her at one point to say, “Hoke, you’re my bestfriend.” Granted, this wasn’t a reciprocal relationship in the normal ways that true friendships are characterized. But Miss Daisy felt closer to Hoke than to her own son. The second movie was The Help. Interestingly, the setting for the movie was the very Jackson neighborhood in which I grew up. Central to the plot was Aibileen, a black woman who served as a maid and nanny for a white family. In so many ways, Aibileen was the mother to the four-year-old girl that she didn’t have in her own biological mom. She would affectionately hold her on her lap and repeat what became a mantra of sorts: “You is smart, you is kind, and you is important.” Aibileen was “the help” who came to work through the back door. But she came through the front door of this girl’s brain and lovingly shaped her self-esteem for a lifetime. So, that brings us up to the person I’d like to tell you about. Chiny was my Aibileen. 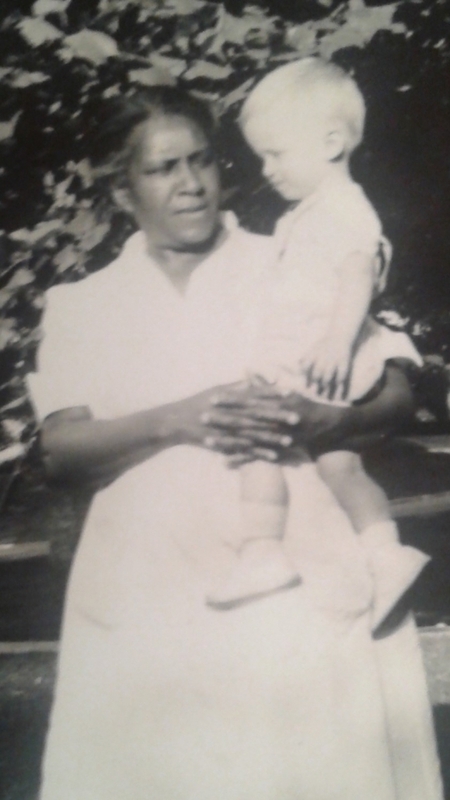 Her full name was China London, a black lady who was my grandmother’s maid and cook for 40 years. Everybody loved Chiny—grandparents, parents, aunts, uncles, cousins, family friends. For a person whose circumstances warranted very little cheeriness, she was the cheeriest person I’ve ever known. I was the youngest of ten cousins. When you’re the youngest, it’s easy to get overlooked and overrun, and that happened to me quite often—or at least I felt it did. Oh, I’m sure it wasn’t done maliciously but, whenever I’d try to say something in this large brood of relatives, somebody in the room would talk over me. I’d wait my turn, try again, and it’d happen again. And again. And again. My exasperation would build so much that I could almost pop. (Just a thought, maybe this was the beginnings of my homicidal impulses. I should probably explore that). I see you and I can imagine how you must be feeling right now. You’re feeling ignored and disregarded. Believe me, I know what that feels like. I’ve lived in a one-down position all my life. Just know that somebody in this room sees it and gets it. Oh, and by the way, you is smart, you is kind, and you is important. Amazing, isn’t it, how much can be communicated by a single look. Chiny was displaying empathy. In that instant, she had climbed into my skin and was walking around in it. The person in the room who deserved empathy more than anyone else was serving it up in large portions. Chiny’s character was more delicious than her food. Indeed, that’s why I say that Chiny is the best example of empathy I’ve ever seen. I don’t know how this works but I’m pretty sure that when I get to heaven, Chiny will be living in the exclusive Heavenly Heights development. I’ll likely be assigned to a residence across town in the less prestigious, but somewhat densely-populated, Hellview Pointe subdivision. I’ll probably ride the bus across town every day to work in Chiny’s yard and to be her help. But, knowing Chiny, I bet she lets me come in the front door. OMG, Alan! Awesome. I was there! I was little Alan. I was the busy grandmother, I was a fast talker…and all of us adored Chiny. You have a way with words, sir! It may sound like I have a lot of empathy, right? But I bet you didn’t know this: My own mother told me that I was the coldest person she had ever met…and she may have been right. Grateful to Jesus! That was BC. Beautiful Alan. Thanks so much for sharing this. I didn’t have a Chiny, but was privileged to have the role of Chiny in the home of my very favorite Nashville patient. I would’ve adopted that little one, but she wasn’t up for adoption. And I knew her mama and family loved her. But so did I. Thanks so much, Kandre. Good to hear from you.